PHOENIX, Ariz. (NBC News) – It’s not often that you open a book and four grand just happens to fall into your lap, but that’s what happened to a woman who was volunteering at a book sale in Phoenix, Arizona. Thousands of people flocked to the 63rd annual VNSAa book sale last weekend. 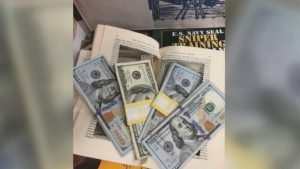 As she was about to put it aside, she noticed that someone had cut a large hole into the book’s pages and placed $4,000 inside. Thankfully, the book had a letter and address inside, making it possible for the money to be returned to its rightful owner.